Mortenson To Build New Hotel Near First Ave? Mortenson Development has a deal to buy a site near the First Avenue nightclub in downtown Minneapolis, where it’s planning a nine-story, 220-room hotel. The site, located at the corner of First Avenue North and 8th Street North, is the same site where Turnstone Group recently suspended plans for a nine-story apartment building due to recent increases in construction costs. Chip Johnson, president of Turnstone, which owns the site, declined to comment on Mortenson’s plans. Bob Solfelt, vice president of Golden Valley-based Mortenson Development, confirmed the company’s involvement in the project. He said it was too early in the process to identify a potential hotel flag, though the hotel would likely be a limited-service one. Examples of limited-service hotel brands are Four Points by Sheraton,Hampton Inn or Holiday Inn & Suites. Mortenson hasn’t submitted any plans to the city yet for the project, but it is aiming to have it open by the time the Minnesota Twins host the MLB All-Star Game at Target Field in July 2014. The site is across the street from the First Avenue nightclub. Part of the site is underneath the path of a skyway that connects a city-owned parking ramp (Ramp A) to the Pence Building, also owned by Turnstone. 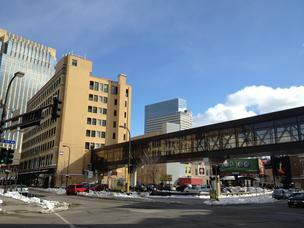 Presumably, Mortenson’s hotel would be built to accommodate that skyway. Mortenson has been active in downtown lately. I wrote Wednesday about its plans to develop 4Marq, a 30-story luxury apartment tower at the corner of Marquette Avenue and South Fourth St. That project is expected to start the formal city development process later this month. Mortenson’s construction division is also the lead builder for the Minnesota Vikings’ new $1 billion stadium that will be built at the site of the Metrodome. http://landmnwi.com/wp-content/uploads/2018/04/CW_Logo_Color_340x156.png 0 0 bwadmin http://landmnwi.com/wp-content/uploads/2018/04/CW_Logo_Color_340x156.png bwadmin2013-05-01 14:15:542016-11-28 22:57:27Mortenson To Build New Hotel Near First Ave?